Hotel Clerks ensure stays are pleasant and enjoyable for guests. Hotel clerks have a people-oriented position that enables them to meet many interesting people every day. A hotel clerk is responsible for many of the responsibilities that keep a hotel running. The position has a very low barrier to entry and has exceptional job stability in areas that promote tourism. What Is a Hotel Clerk? A hotel clerk is responsible for aiding guests staying at hotels, motels and resorts. The clerk will often check-in guests and check-out guests, but they will also be responsible for other related tasks such as giving desks directions and arranging special accommodations. A hotel clerk needs to be cheerful and upbeat and needs to have very good people skills. Hotel clerks have a mean annual wage of $21,960 according to the Bureau of Labor Statistics and a hotel clerk does not have any minimum of required education. The position of a hotel clerk is an entry-level position that has relatively strong upward mobility within the industry. There are also other positions within a hotel that can be moved into if a career change is desired. What Does a Hotel Clerk Do? Hotel clerks essentially tend to all the needs of hotel guests. A hotel clerk needs to know quite a lot about an area and will have more responsibilities in higher priced venues such as luxury resorts. For the most part, the hotel clerk will often need to be proficient in the hotel’s booking software and will often need to take bookings, check-ins and check-outs. The clerk will need to ensure they accurately book guests and that they get the information necessary, such as credit card numbers. Throughout the day a hotel clerk will also often be called for information about the hotel or to provide services like additional key cards, toiletry kits, towels and more. The hotel clerk will often need to manage multiple tasks and prioritize these tasks based on urgency. In smaller venues, a hotel clerk might also need to perform additional related tasks, such as readying a breakfast room for the guests. How Do You Become a Hotel Clerk? Becoming a hotel clerk is usually as simple as applying for a position with a hotel and waiting for an opening. The competition for these positions can be significant but those with prior customer service experience will usually have an advantage over others. Hotel clerks do not need any particular education and they will usually have on-the-job training to cover all of the relevant tasks. Those already within the hospitality industry will usually be able to move between hotels with ease. How Do You Advance as a Hotel Clerk? Advancement as a hotel clerk can come in many ways. Hotel clerks that perform their duties well can become shift managers at the hotel and can become responsible for the other workers on their shift. 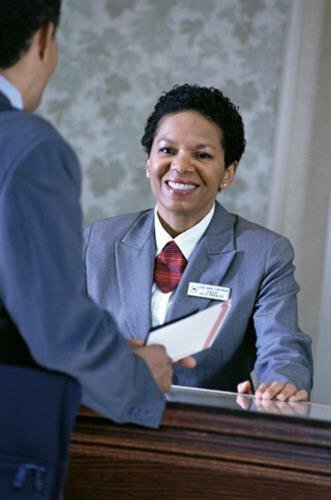 Hotel clerks can also eventually become assistant managers and eventually even managers at their hotel chain, though this usually requires the acquisition of a degree. An Associate’s Degree or Bachelor’s Degree in Hospitality or Business can go a long way within the industry. Those that wish to remain hotel clerks can find higher levels of pay and higher levels of responsibility in luxury venues such as resorts and spas. Major metropolitan areas and major tourist destinations will also usually pay their hospitality staff significantly more than other areas. Hotel clerks seeking a change in career but not necessarily advancement can move into other areas of the hospitality industry, such as concierge services or baggage services within the hotel. Hotel clerks can also move into the related field of information clerk or administrative support, which according to O*Net Online pays more on average.